It’s a common problem in this day and age: You want to shed a couple pounds and get in those important 30 minutes or more of exercise a day, but in between the sedentary lifestyle of work and a million other responsibilities that need tending to, regular workouts get thrown by the wayside. A great way to solve this problem and save plenty of money in the process is to bike to and from work each day. Of course, this isn’t practical for some people, as you might live too far away from your work or the topography of your city might be too extreme. But for those who can manage it, biking to work can be an excellent way to stay in shape, save a ton on gas money, and do your part to protect the environment. 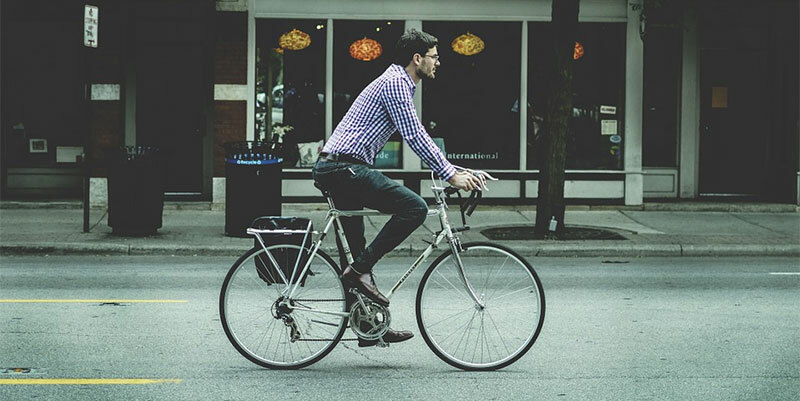 In this post, we’re going to look at five benefits of biking to work and hopefully convince you to start pedaling in the process. It’s much cheaper than driving. It’ll add time to your life that you’d otherwise be wasting. Riding a bike is so cheap, you don’t even have to own one. Riding a bike every day will decimate your healthcare expenditure. It’ll make cycling safer for everybody. Bikes don’t need parking spaces. In this economy, it’s important to save as much as you possibly can. One often overlooked expense that can quickly eat into your expenses is gas money. You might need to spend the occasional amount on a replacement inner tube or extra rim, but the expenses of a bike won’t even come close to how expensive gas can be in the long run. Not only will riding a bike help to keep you in shape, but it’ll do so in a way that’s totally useful to you. Some people get hung up on running to literally nowhere on a treadmill or pedaling on a stationary bike while spacing out and watching TV. When you bike to work, you have a destination in mind and a strategy on how to get there. It’s like a mini adventure every time you go to work. On top of all of those benefits, this will also save you plenty of money a month on unnecessary gym fees that you’d otherwise be paying for. The time you spend in traffic might not seem like much at first glance, but it all really adds up in the long run. This isn’t a problem you really have to worry about with a bike, though. Instead of sitting in traffic and spacing out, you can use your time working on your whistling skills or maybe even plotting out the next great American novel. If you live in a major city, it’s not even necessary for you to own a bike. There are a number of bike-sharing programs that are popping up all over the place. While you will have to pay the fees associated with renting the bike each day, you won’t have to spend anything on tire replacement or upkeep, not to mention the amount that you’d otherwise be spending on gas that you can now save. It goes without saying, but the more physically fit you are, the less likely you’ll be to suffer from some kind of physical ailment. This will eventually lead to lower premiums and to you wanting to give yourself a high five. Use that excitement on going for another bike ride! When more cyclists are on the road, it becomes that much safer for everybody involved. And on top of that, when more and more motorists see just how many cyclists are on the road, they’ll be that much more likely to commute by bicycle too. This truly is an instance of being the change you wish to see in the world. Along with the problem of annoying traffic jams that waste your time and prevent you from getting to work on time, there’s always the problem of finding a parking space and then having to trek all the way to your building. Not only do bikes not require a parking space, but the areas where you lock up your bike tend to be very close to the buildings you’ll need to access. While this list isn’t exhaustive, it should give you a pretty good idea as to why you should seriously consider buying a bike and using that to commute to and from work every day. There are a bevy of health benefits that you can take advantage of, you’ll save plenty of cash, and you’ll literally save hours of your life that would otherwise be spent idly daydreaming in traffic. Whatever your particular reason of choice is, it’s clear that using your bike to commute is a great choice to make.